The Cravat, it is Time. Last fall, the BBC mused the cravat could be making a comeback, as did Menswear Style UK. A year later, I am still waiting. I named my site Cardigans and Cravats, because they summed up my geekery, my passion, incredibly well. It's easy enough to deduce the "cardigan" is a staple in my life. Over the years it has become synonymous with bookishess, nerdiness, etc. The "cravat" side of the name, does leave a few confused. Unless you have picked up on the Britishness and period piece trends on the site (Why I am Thankful For Period Piece Adaptations series, Jonathan Crombie, the Perfect Gilbert Blythe, Waistcoats vs Vests. I am an anglophile, I am a period piece junkie, I am the kind of person who swoons over a man in cravats, waistcoats, and tailored jackets with tails. I am a person ready for the cravat to come back. 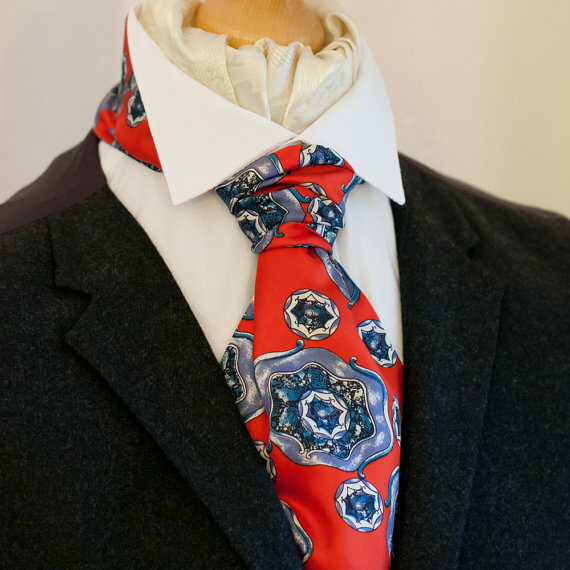 Maybe the trend is hopping in the UK, but to me, it definitely feels a bit more an ascot (as demonstrated above with photographs from Cravat Club, a British shop for cravats and pocket squares). To note: all ascots are forms of cravats (as are modern ties and bow ties), but not all cravats are ascots. The basic definition of a cravat also leads to the confusion: "a short, wide strip of fabric worn by men around the neck and tucked inside an open-necked shirt". So, yes, a ascot is a cravat (and if you are wearing them, you have my admiration and respect) and yes, they are back in style... at least in the UK. However they are tied differently than the cravats that I am referring to. How does one do this without coming across like a costume or dare say it... a hipster? I think it really comes down to three steps: selecting the right cravat (fabric, color, pattern, etc), styling, and staying true to youself. Rules are rules and to wear a cravat you must pair it with a shirt with a collar. It is in the definition, after all. That doesn't mean you are forced to wear it with a longsleeved shirt; you could also opt for a short sleeve (especially if you are layering with a waistcoat or jacket). You also can mix and match with fun collars or patterns. The only guideline you have to stick to is it has to have a collar. After that it is really adapting the cravat to your personal style. Again, waistcoats always pair nicely with a cravat, as do jackets (tweed, wool, etc). A nice pair of trousers is a must, but this could include denim and again, adding in some fun prints or fabrics: a fun bright color like pink, or tweed pants that match your jacket, or a classic English plaid could also pair wonderfully. Though sporting a simple ascot, I think this image illustrates the fun one can have with this classic neckwear, especially with mixing prints and patterns (image from earnest.). I do think certain accessories could make your outfit tip over to costume. These include pocket watches or certain styles of hats that are reminiscent of the past (fedoras, newsboy caps, to bowlers). The right pocket square or tie clip could add the right touch if not over the top. When it comes to shoes, feel free to mix it up with nice oxfords or basic boots to a pair of clean trainers, like Converse. The beautiful thing about cravats is there are a few different ways to style and wear them. You could wear them like the simple ascot style above or delve into the various ways to tie them (and thanks to the internet there are many tutorials available). Whether you want simple patterns, something bold, or something that expresses your geekier side, you can find the right cravat to add to your wardrobe. Though a standard for gentlemen, I also believe, like ties, waistcoats, and suits, that women too can and should incorporate the cravat in their bag of fashion tricks. Here is a sample of styles in blue, black, and red I have curated for your enjoyment. Through these selections and the links above, such as the Cravat Club, you are sure to find the right match for you or someone you think should rock a cravat. Either way. It's time, Cravat. Please come back and stick around this time.